Agilent Technologies Inc. (NYSE: A) has announced the industry's first secure digital ultra-high-speed card-compliance test software. The new SD UHS-II bus interface technology increases secure digital performance with data rates up to 1.56 Gb/sec in consumer electronics applications. The compliance test package helps designers accelerate the development of SD UHS-II card-based systems and ensure their interoperability. The Agilent N6461A SD UHS-II card compliance test application, which runs on Agilent Infiniium 9000 and 90000 Series oscilloscopes, provides SD UHS-II card physical-layer compliance measurements consistent with the SD Association 4.0 SD card specification. SD is a leading standard for removable memory cards used in portable devices (digital camcorders and cameras, GPS receivers and mobile phones). The UHS-II memory card provides high-definition video recording with low power consumption and high data rates. 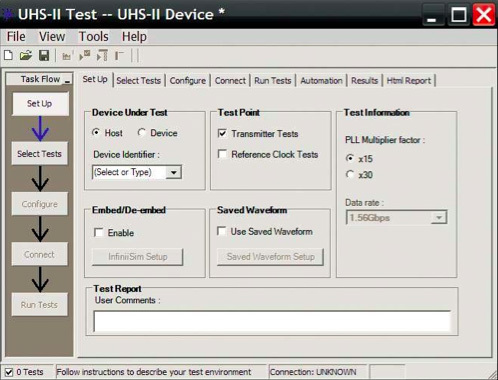 The Agilent SD UHS-II card compliance test software provides automated physical-layer testing capability for host and device transmitter tests in the SD 4.0 specification. The software automatically configures the oscilloscope for each test and generates a HTML report at the end of the test. The report compares the results with the specification test limit and indicates how closely the device passes or fails each test. Engineers can easily debug data signal integrity issues using the oscilloscope SD UHS-II card compliance test application and J-BERT N4903B high-performance serial BERT. J-BERT generates test patterns like the PRBS 2^7-1 pattern that is looped back from the UHS-II memory card to the oscilloscope for signal-integrity testing. "Agilent has been working with SD UHS-II technology leaders to help define the test methodology for testing the new UHS-II memory cards," said Jay Alexander, vice president of Agilent's oscilloscopes business. "Agilent's expertise in physical layer testing helps our customers achieve conformance on their SD UHS-II products using our compliance tools with the oscilloscope and J-BERT." "Agilent's compliance test suite provides a solid test environment for checking UHS-II system health quickly and easily," said Miki Takahashi, analog design manager at O2Micro, a supplier of SD host devices. "Test results help designers create a robust system with reasonable operating margin and excellent signal integrity." Information about Agilent's N6461A SD UHS-II card compliance test application is available at www.agilent.com/find/N6461A. Product images are available at www.agilent.com/find/N6461A_images. The Agilent N6461A SD UHS-II card compliance test application is available now and is priced at $4,500.